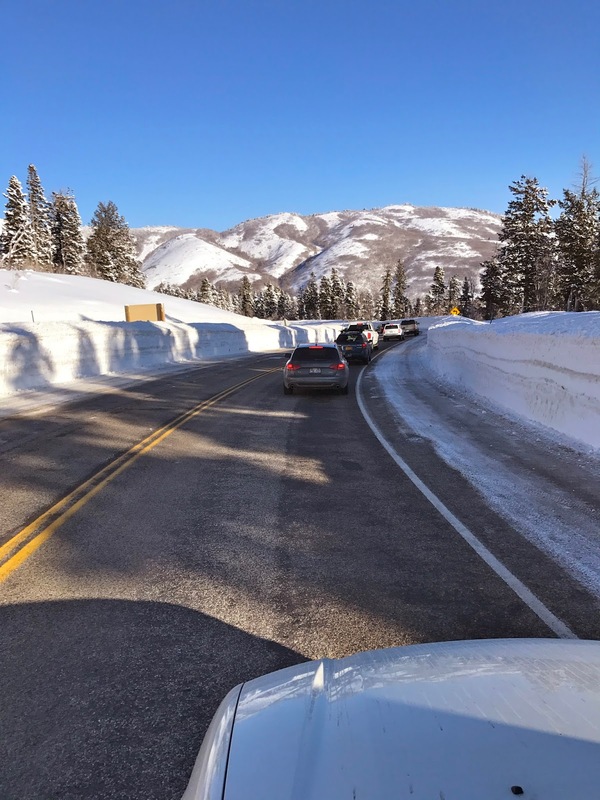 What started with what was once an unusual sight, traffic at Snowbasin, ended with some unusual ski lines. The traffic has become more of a usual occurrence, and I had thought that the day's tour with my oldest touring partner, Ben Geiger, was going to pan out similarly as well. However, we found some unusual situations in the usual places. ^Traffic. Once unusual. Now pretty usual. However, just like anywhere else. A little foresight mixed with a tiny bit of extra effort, and it is not really a big deal. It still does not even moderately resemble the dog and pony show that occurs in the Cottonwood Canyons each weekend. I am grateful for that. 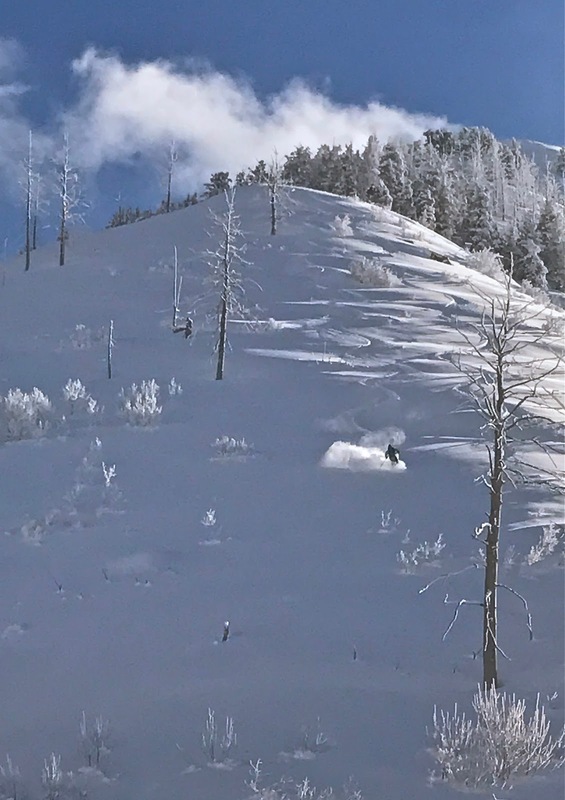 ^As usual, these Snowbasin backcountry access boot packs are pretty lonely. 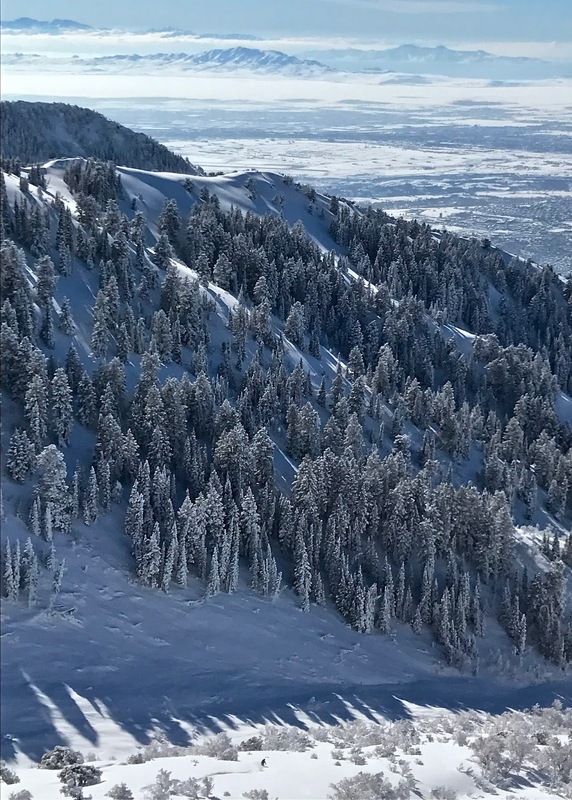 There is still relatively little skier traffic in the Ogden backcountry. There is indeed a bit more now then 17 years ago when I showed up, but not a lot by any definition I have come across anywhere on earth since. ^Ben and I were set on pretty much a usual game of bowl skipping above and behind Snowbasin for the day. We had talked about a tentative plan, and it was nothing out of the ordinary for one of our local tours. Our first line into Porky Cirque proved as such. ^Good ole fashioned first tracks just above Snowbasin. ^After our first lap we figured on continuing over onto the west face of Mt. Ogden to see how the lines were shaping up out there. The snowpack was relatively green light for most of the objectives we had in front of us for a mid-winter tour. When we came around for our first west face lap looking into one of the classics we decided to go just north to try a little different aspect and entry into the same area. Talking through the decision we landed on trying out something a little more unusual. I worked out really well. It kind of lit a fire in us to add a little extra something different to what could have easily been a typical tour. The next lap we did the same. ^We took our metaphorical typical glasses off. We were seeing the same area through a whole different lens. 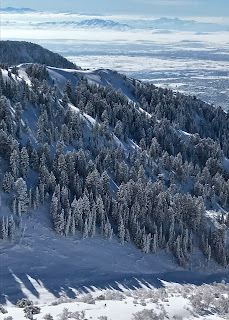 In reality it was the lens of an unusually deep low elevation snowpack. Whatever the lens though, we were energized by how things were looking through the new light. Ben nabbed this south face down relatively low that we almost always just ski right by on our way to the usual lines. Skiing this one brought something unusual to the tour, thus making it a stand out memory against the usual tour. I try to stay present and grateful all the time, but everyone can get sucked into the usual routines. I was super pumped to take advantage of the unusual snowpack depth down low to add something extra to our day's adventure. ^It was a fresh line, a new perspective, and all good too as you can see in Ben swooping through the shoulder of scrub oak and powder! 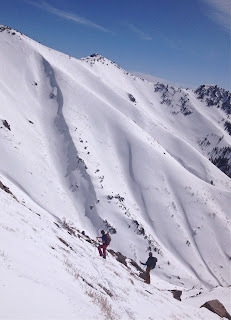 ^Coming over the next ridge's skin ascent we found ourselves above another classic area on the west face of Mt. Ogden, but this time we were seeing the effects of the morning's traffic in that the typical ski route. It was actually pretty skied up, and there was a party of skiers lingering rather long on the slope below as well. Seemingly as if they were lost or something. 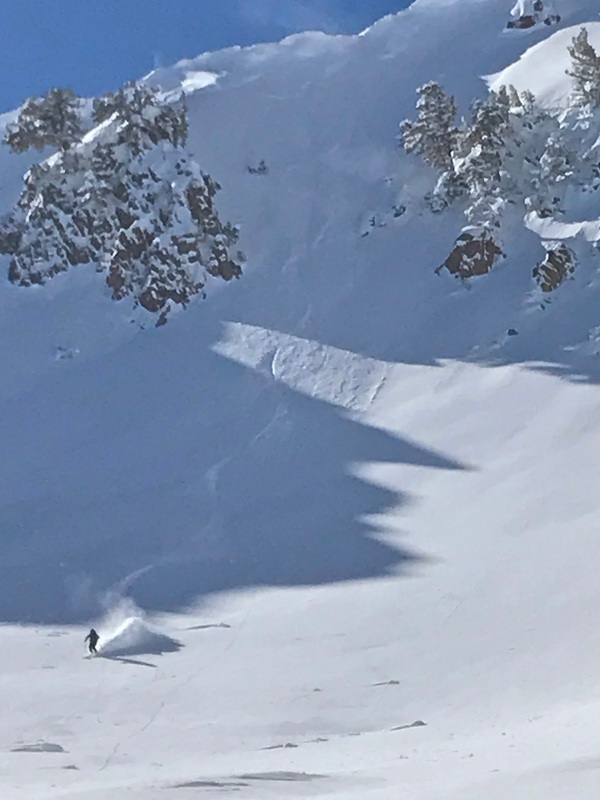 While waiting at the top of the ridge for the wandering folks below to be clear of the avalanche prone slope, we spotted a low elevation face that almost never holds snow long enough to be skiable. 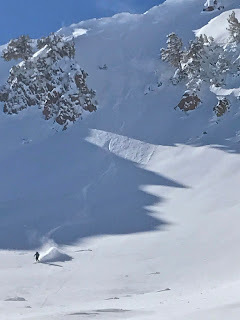 However, with the unusual snowpack it was looking prime, and Ben and I's decision to go try and ski it also led us to consider the more northerly shoulder around the tracked out typical shoulder and the party dangerously lingering in avalanche terrain. Also rather unusual for the Ogden backcountry. 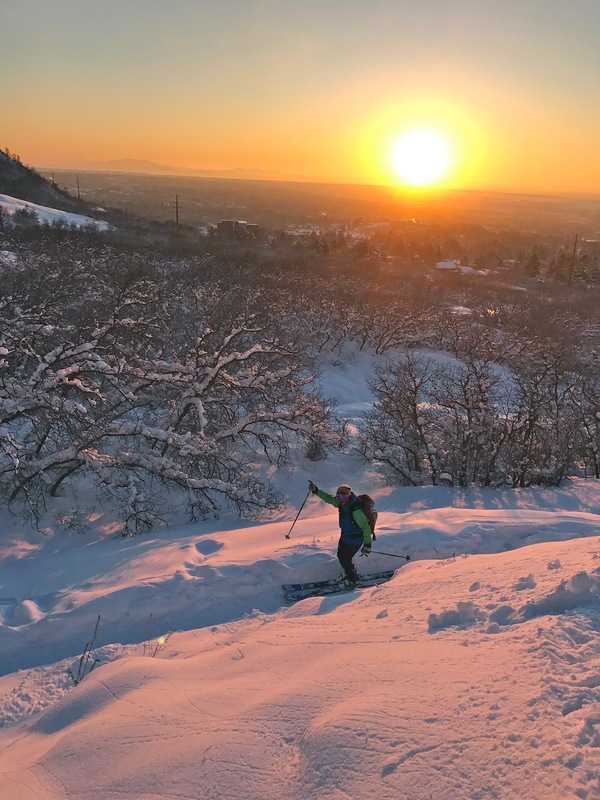 Most of the Ogden backcountry community is pretty smart for the most part typically. This other shoulder of burned out trees that laid slightly to the north of the usual route was fantastic. Yet again, the unusual choice paid off. As the picture above shows, it was great skiing, and also led us more directly to the next approach for the most unusual line of the day. ^Good call. The last lap yielded more plentiful turns. I am holding back at showing too much of this most unusual face we skied on this usual day in our usual area though. Mostly because I don't really want to give that one away. 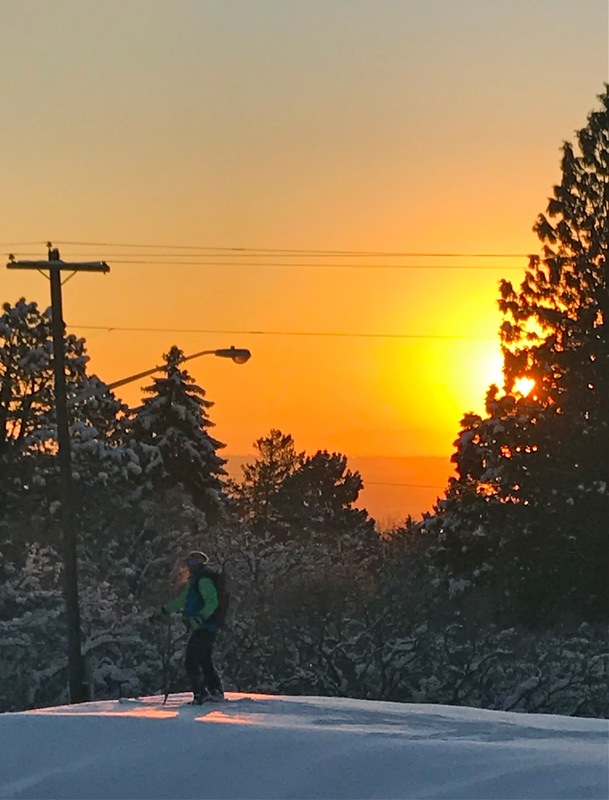 While we are seeing unusual traffic in Ogden these days, and I will often share the usual zones with warranted inquiring people, even I have to draw the line somewhere. I will be keeping this most unusual face between Ben and I… and our buddy, Travis, who saw it from his house in Ogden City and asked me about it a few days later. Had to own that one, and mostly because Travis is the kind of guy who has earned his stripes out there many times over. I will always share info with a solid dude like him. Maybe just not on the internet. Hahaha! Sorry. ^…and like Ben's cold breath in the sunset light in this picture above, the day stood out just a little bit more then our usual tours in our backyard backcountry. The memory cemented in our hearts just a little bit more. I am always searching this globe far and wide for authentic and genuine experiences in my adventures, and it is easy to forget that even just the slight shift in perspective in one's very own backyard can achieve the same richness as a transcontinental journey to some far off powder haven. As in many things in life, it always boils down to one's perspective on things, and just adding in a bit of unusual in the usuals can shine a whole new light on a situation and make us see familiar things very differently. Also, deeper then usual low elevation snowpacks… yeah... that helps too!